If you’re a serious triathlete, there is a new book on the market that is tailored specifically to help you cross the finish line fueled by your best personal nutrition plan based on the specific competition in which you’re involved. 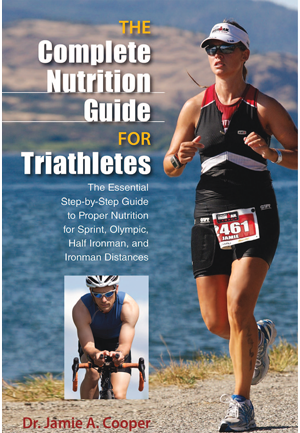 Written by Dr. Jamie A. Cooper, “The Complete Nutrition Guide for Triathletes” is really a comprehensive nutrition guidebook written for triathletes by a triathlete. An assistant professor at Texas Tech University, Dr. Cooper teaches undergraduate and graduate courses in Sports Nutrition and a graduate course in Sports Supplements and Ergogenic Aids. She is also a kinesiology expert with an emphasis in exercise physiology and nutritional sciences. Having grown up playing sports, Dr. Cooper has spent the last 14 years competing in triathlons and marathons. As an endurance athlete, it was her frustration in not finding a comprehensive nutrition guide for triathletes that led her to write this book. “I am continually amazed,” writes Dr. Cooper, “at how much time triathletes spend making sure they have the right gear, optimizing their training plans, or selecting races that have courses designed to help them achieve a personal record (PR). Yet, the one thing I see most triathletes overlook or ignore completely is their nutrition.” If you are involved in Sprint, Olympic, Half Ironman and Ironman Distances and have shared her frustration about the lack of detailed nutrition information, be frustrated no more. It’s clear that Dr. Cooper doesn’t overlook anything. Broken into three parts, the first section looks at the essential nutrients in a triathlete’s diet – the carbohydrates, proteins, fats, vitamins, minerals and fluids. For example, simply taking supplements in a shotgun approach without a need for them in a personal nutritional plan doesn’t make sense. An anemic athlete, for instance, taking iron supplements will see an increase in performance but a triathlete who’s not deficient in any mineral won’t see any performance increase. She also shares the importance of phenomena such as cardiac drift. Dr. Cooper says she learned about this as an exercise physiologist but didn’t fully understand its importance until she started to monitor her own heart rate. Part two focuses on a triathlete’s training and race-day nutrition. Beginning with appropriate nutrient intake before, during and after training sessions, Dr. Cooper then takes each of the Sprint, Olympic and three triathlon disciplines and shares information on pre-race, during-race and post-race recovery and nutrition. Included are such handy guidelines on how to calculate your pre-race carbohydrate intake, and important “Make Note” tidbits, like the fact that post-race recovery nutrition should begin within a 15-30 minute critical window to reach maximum recovery. Special topics – weight loss and weight maintenance; supplements and ergogenic aids; illness and injury; frequently asked questions and top ten nutrition tips – form part three of the book. If you’ve had questions about pre-race jitters, tapering, or late-night eating, for example, Dr. Cooper provides pragmatic advice based on both her professional training and personal experience. She also includes an Appendix that is absolutely amazing in the amount of specific information it provides on such things as common sports beverages, common salt and electrolyte tablet products and specific food products. To learn more about Dr. Cooper, you can visit her website at competitive-nutrition.com. Her book can be purchased on Amazon.com, Barnes and Noble and other bookstores.